Struggling with the Kingdom Hearts 3 Ultima Weapon unlocking? Here are all the Orichalchum+ locations you need. 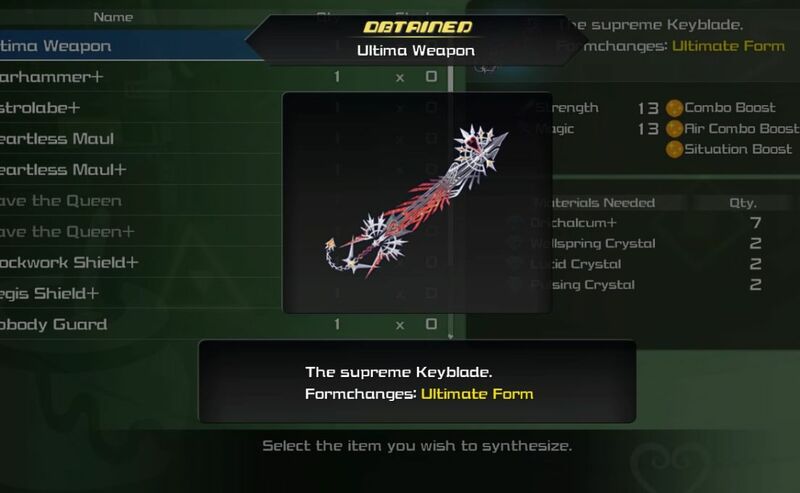 The Ultima Weapon is the most powerful Keyblade you can unlock in Kingdom Hearts 3 and has been included in almost every title of the series so far. But what makes this version of the Ultima Weapon stand out from its previous iterations (and worth the grind) is in its Keyblade transformation. As always, the Ultima Weapon must be crafted through the workshop. But before you’re able to do this, you have to have acquired at least one of every synthesis material in the game to unlock the Ultima recipe. By the time you’ve come to the end of the main storyline, you should already be pretty close to achieving this. The only material you will most likely be missing is one of the seven Orichalcum+ materials needed specifically for the Ultima Weapon. Fortunately, this handy little guide will tell you exactly how to acquire all of them. Along with the seven Orichalcum+ materials, you will also need two each of Wellspring Crystals, Lucid Crystals and Pulsing Crystals. The latter two can each be crafted in the workshop and Wellspring Crystals can be easily obtained from completing Battlegate 12 in the San Fransokyo world. Head to the Keyblade Graveyard and select The Badlands as your landing point. Once you load in, turn around and head all the way back until you reach the pink portal that takes you back to The Final World. Enter the portal and you’ll immediately see a chest with the Orichalcum+ material inside. Head to Arendelle and land at The North Mountain Ridge. After that, speak to Elsa who will let you take part in the Frozen Slider mini-game. You have to collect ten numbered treasures hidden throughout the course. You won’t be able to collect all ten in one go but you can take as many attempts at the course as you like. After finding all of them, you’ll be rewarded with the Orichalcum+. Go to The Caribbean and load in at the Huddled Isles. From here, fast travel or sail over to the Exile Island and it shouldn’t take much searching to find the chest tucked away in a small grove. Probably the most time-consuming thing you have to do, although not that particularly challenging. Simply snap a shot of all 90 of the Lucky Emblems hidden throughout the worlds and you’ll be given an Orichalcum+. Annoyingly, one of the Orichalcum+ materials can only be obtained through a random reward generated each time you use one of the postcards at the mailbox in Twilight Town. The postcards are obtained after spending munny at the shop, but it is unclear how much munny you have to spend to receive a postcard. I’d advise you save your game before attempting to send any postcards. Then, if you are unsuccessful, continue to reload the save until you’re granted the Orichalcum+. In The Eclipse, you must first defeat the Gigant Pyramid boss in the Gummi ship. After that, another four bosses are unlocked, each at a different point of the structure in the middle of the map (one on each side and one at the bottom). After defeating all of these, the Omega Machina will spawn at the top of the structure. Make sure you’ve assembled a powerful Gummi ship as this will be a pretty difficult battle – I found that equipping some Shield Gummi’s helped out a lot. After finally defeating the boss you’ll be given the Orichalcum+ material. In all of the seven Disney worlds, there is an unusual dessert-themed Heartless called a Flan, each with a different fruit on its head. Each Flan challenges you to a mini-game in which you must beat the high score and be rewarded with three of its fruit. If it only gives you one piece of fruit, it means that you didn’t beat its score. Finding and achieving the high score for each of the seven Flans will reward you with your final Orichalcum+ piece.